Maria Richards, coordinator of the SMU Geothermal Laboratory in the Huffington Department of Earth Sciences, has become the 26th president of the Geothermal Resources Council (GRC), as announced by the GRC on Thursday, Jan. 26, 2017. She is the first woman president in the history of the global energy organization. The GRC is an international geothermal body that focuses on continuing professional development for its members through its outreach, information transfer and education services. Richards has been at the forefront of SMU’s geothermal energy research for more than a decade, and the University’s mapping of North American geothermal resources is considered the baseline for U.S. geothermal energy exploration. SMU’s Conference on Geothermal Energy in Oil and Gas Fields, which she directs, is pioneering the transition of oil and gas fields to electricity-producing systems by harnessing waste heat and fluids. Her projects range from computer-generated temperature-depth maps for Google.org to on-site geothermal exploration of the volcanic islands in the Northern Mariana Islands. Along with Cathy Chickering Pace, she also coordinates the SMU Node of the National Geothermal Data System funded by the U.S. Department of Energy. Recently, Richards and her colleagues completed a high-resolution shallow Enhanced Geothermal System (EGS) potential analysis for the Cascades region of the U.S. Pacific Northwest for the National Renewable Energy Laboratory. Her other projects include the Eastern Texas Geothermal Assessment, the Dixie Valley Synthesis, and the resource assessment for the influential MIT report The Future of Geothermal Energy. She previously served on the GRC Board of Directors and was chair of the Outreach Committee in 2011-12. She was also a Named Director of the 2015 Board for the Texas Renewable Energy Industries Association (TREIA). Richards holds an M.S. degree in physical geography from the University of Tennessee, Knoxville and a B.S. in environmental geography from Michigan State University. The SMU Geothermal Laboratory will host its seventh international energy conference and workshop on the main campus May 19-20, 2015. The conference is designed to promote transition of oil and gas fields to electricity-producing geothermal systems by harnessing waste heat and fluids from both active and abandoned fields. Researchers from the Huffington Department of Earth Sciences in SMU’s Dedman College of Humanities and Sciences will present results from their Fall 2014 Eastern North American Margin Community Seismic Experiment (ENAM CSE) research. In addition, equipment such as one-well systems, desalination and other new technologies will be explored. SMU has been at the forefront of geothermal energy research for more than 45 years, and the Geothermal Laboratory’s mapping of North American geothermal resources is considered the baseline for U.S. geothermal energy exploration. Geothermal Laboratory Coordinator Maria Richards and Emeritus Professor David Blackwell have seen interest in geothermal energy wax and wane with the price of oil and natural gas. But Richards believes current low oil prices will drive more interest in geothermal development, encouraging oil and gas producers to use geothermal production from existing oil and gas fields as they try to keep them cost-effective for petroleum production at 2015 prices. The technology that will be examined at the conference is relatively straightforward: Sedimentary basins drilled for oil and gas production leave behind reservoir pathways that can later be used for heat extraction. Fluids moving through those hot reservoir pathways capture heat, which at the surface can be turned into electricity, or used downhole to replace pumping needs. In addition, the existing surface equipment used in active oil and gas fields generates heat, which also can be tapped to produce electricity and mitigate the cost of production. Featured speakers include Jim Wicklund, managing director for equity research at Credit Suisse, who will speak on “Volatile Economics in the Oil Field,” and Holly Thomas and Tim Reinhardt from the U.S. Department of Energy’s Geothermal Technologies Office. STW Water Process & Technology, a water reclamation and oilfield services company, will have desalination equipment on-site for attendees to understand size and scaling capacity of water purification for oil field operators. Registration is still open; walk-ups will be accepted. For more information, visit smu.edu/geothermal. Maria Richards, coordinator of the SMU Geothermal Laboratory in the Huffington Department of Earth Sciences, has been named president-elect of the Geothermal Resources Council. She will become the 26th president of the global energy organization beginning in 2017, and the first woman president in its history. Richards has been at the forefront of SMU’s geothermal energy research for more than a decade, and the University’s mapping of North American geothermal resources is considered the baseline for U.S. geothermal energy exploration. SMU’s Conference on Geothermal Energy in Oil and Gas fields, which Richards directs, is pioneering the transition of oil and gas fields to electricity-producing systems by harnessing waste heat and fluids. “This also is a unique occasion for me to encourage and mentor young women to participate in the sciences throughout their careers and get involved in leadership roles,” she added. SMU’s seventh international geothermal energy conference and workshop is scheduled for May 18-20, 2015, on the Dallas campus. Designed to reach a broad audience, from the service industry to reservoir engineers, “Power Plays: Geothermal Energy in Oil and Gas Fields,” is an opportunity for oil and gas industry professionals to connect with the geothermal and waste-heat industries to build momentum. The conference is a platform for networking with attendees from all aspects of project development. Presentations will highlight reservoir topics from flare gas usage to induced seismicity and will address new exploration opportunities, including offshore sites in the eastern United States. Richards’ projects at SMU’s Geothermal Laboratory vary from computer-generated temperature-depth maps for Google.org to on-site geothermal exploration of the volcanic islands in the Northern Mariana Islands. Along with Cathy Chickering Pace, Richards coordinates the SMU Node of the National Geothermal Data System funded by the U.S. Department of Energy. Richards has previously served on the Geothermal Resources Council Board of Directors and was chair of the Outreach Committee in 2011-12. She is also a Named Director of the 2015 Board for the Texas Renewable Energy Industries Association (TREIA). New research from the SMU Geothermal Laboratory, funded by a grant from Google.org, documents significant geothermal resources across the United States capable of producing more than three million megawatts of green power – 10 times the installed capacity of coal power plants today. Sophisticated mapping produced from the research, viewable via Google Earth, demonstrates that vast reserves of this source of power are realistically accessible using current technology. The results of the new research, from SMU Hamilton Professor of Geophysics David Blackwell and Geothermal Lab Coordinator Maria Richards, confirm and refine locations for resources capable of supporting large-scale commercial geothermal energy production under a wide range of geologic conditions, including significant areas in the eastern two-thirds of the United States. The estimated amounts and locations of heat stored in the Earth’s crust included in this study are based on nearly 35,000 data sites – approximately twice the number used for Blackwell and Richards’ 2004 Geothermal Map of North America, leading to improved detail and contouring at a regional level. Based on the additional data, primarily drawn from oil and gas drilling, larger local variations can be seen in temperatures at depth, highlighting more detail for potential power sites than was previously evident in the eastern portion of the U.S. For example, eastern West Virginia has been identified as part of a larger Appalachian trend of higher heat flow and temperature. Conventional U.S. geothermal production has been restricted largely to the western third of the country in geographically unique and tectonically active locations. However, newer technologies and drilling methods can now be used to develop resources in a wider range of geologic conditions, allowing reliable production of clean energy at temperatures as low as 100˚C (212˚F) – and in regions not previously considered suitable for geothermal energy production. Preliminary data released from the SMU study in October 2010 revealed the existence of a geothermal resource under the state of West Virginia equivalent to the state’s existing (primarily coal-based) power supply. Blackwell is scheduled to release a paper with details of the results of the research to the Geothermal Resources Council in October 2011. New research produced by SMU’s Geothermal Laboratory, funded by a grant from Google.org, suggests that the temperature of the Earth beneath the state of West Virginia is significantly higher than previously estimated and capable of supporting commercial baseload geothermal energy production. Geothermal energy is the use of the Earth’s heat to produce heat and electricity. “Geothermal is an extremely reliable form of energy, and it generates power 24/7, which makes it a baseload source like coal or nuclear,” said David Blackwell, Hamilton Professor of Geophysics in the Huffington Department of Earth Sciences and Director of the SMU Geothermal Laboratory. The SMU Geothermal Laboratory has increased its estimate of West Virginia’s geothermal generation potential to 18,890 megawatts, assuming a conservative 2 percent thermal recovery rate. The new estimate represents a 75 percent increase over estimates in MIT’s 2006 “The Future of Geothermal Energy” report and exceeds the state’s total current generating capacity, primarily coal based, of 16,350 megawatts. The West Virginia discovery is the result of new detailed mapping and interpretation of temperature data derived from oil, gas, and thermal gradient wells – part of an ongoing project to update the Geothermal Map of North America that Blackwell produced with colleague Maria Richards in 2004. Temperatures below the earth almost always increase with depth, but the rate of increase (the thermal gradient) varies due to factors such as the thermal properties of the rock formations. Blackwell thinks the finding opens exciting possibilities for the region. “The proximity of West Virginia’s large geothermal resource to east coast population centers has the potential to enhance U.S. energy security, reduce CO2 emissions, and develop high paying clean energy jobs in West Virginia,” he said. SMU’s Geothermal Laboratory conducted this research through funding provided by Google.org’s RE<C initiative, which is dedicated to using the power of information and innovation to advance breakthrough technologies in clean energy. SMU researcher among experts at Geothermal Showcase in D.C.
Maria Richards, coordinator of SMU’s Geothermal Lab, was among the industry leaders and experts presenting a Geothermal Showcase at the Newseum in Washington, D.C., on May 6. Participants virtually visited some of the leading geothermal energy development projects in the United States and heard from companies at the forefront of geothermal power growth. A panel of leading geothermal scientists discussed how geothermal resources can contribute to the world’s energy needs. When most people think of geothermal energy, they usually think of extremely high heat, such as geysers. But the Geothermal Map of North America produced by Richards and Professor David Blackwell for the American Association of Petroleum Geologists in 2004 revealed locations all over the United States where subsurface temperatures are high enough to drive small, binary power plants and generate electricity. Blackwell and Richards are members of the Roy M. Huffington Department of Earth Sciences in SMU’s Dedman College. This kind of power plant is similar to an air conditioning unit run backwards, using heat to generate electricity. The hot water that runs through one chamber in the pump heats fluid with a lower boiling point in an adjacent chamber, which expands into high-pressure vapor and drives a turbine. Deep drilling through hard rock is expensive, which is one reason traditional geothermal energy development has lagged behind green technologies like wind and solar power. But Blackwell’s mapping has proven that many existing oil and gas wells in Texas, Louisiana, Mississippi, Alabama and some mid-continent states reach shallower depths where temperatures still range from 200-300 degrees Fahrenheit – hot enough for a binary power plant to do its job. The Geothermal Showcase was sponsored by the Geothermal Energy Association along with Ormat, Enel North America, and Pratt and Whitney Power Systems. Search engine giant Google will help fund SMU’s geothermal resource mapping, underscoring the importance of the University’s research toward alternate energy technology. 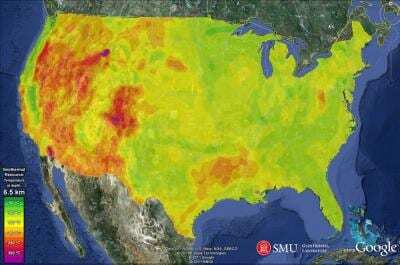 Google.org, the philanthropic arm of the Silicon Valley web company, will grant nearly $500,000 to the Geothermal Lab in SMU’s Dedman College of Humanities and Sciences to update mapping of geothermal resources. The Google grant will allow SMU to provide information on the potential for geothermal energy production in regions where geothermal data has previously been spotty or unavailable. David Blackwell, Hamilton Professor of Geothermal Studies in the Huffington Department of Earth Sciences, and Maria Richards, Geothermal Lab coordinator, previously collaborated on the Geothermal Map of North America (right) for the American Association of Petroleum Geologists in 2004. The SMU map shows the potential for enhanced geothermal systems development nationwide. • Read more from SMU News. • See a Google.org video on how enhanced geothermal systems work. The SMU Physical Plant is testing the performance of the “Green Machine,” which can generate electricity from waste heat. Geothermal Lab Coordinator Maria Richards discusses the Machine’s usefulness as a teaching tool in this CW 33 video from July 25, 2008. Peter Weyand, Simmons School of Education and Human Development, discussed Usain Bolt’s Olympic sprinting performance, and the possibility of humans someday running as fast as the fastest four-legged animals, with The Times of India Aug. 20, 2008. Suku Nair, Computer Science and Engineering, talked about growing concerns for the security of wireless technology with Fox 4 News Aug. 17, 2008. Dave Wollman, Track and Field/Cross Country, shared tips on how to train like an Olympian with The Dallas Morning News Aug. 12, 2008. Fred Moss, Law, discussed recent developments in the Dallas City Hall corruption case with CBS 11 News Aug. 13, 2008. He talked about the merits of hate-crime charges being filed against a man accused of committing random shootings in four Dallas suburbs with The Dallas Morning News July 9, 2008. In addition, he discussed the issues involved in using DNA testing to exonerate those who may have been wrongly convicted of crimes with Reuters July 2, 2008. Van Kemper, Anthropology, spoke with The Dallas Morning News Aug. 12, 2008, about how the proposed renaming of historic Ross Avenue has put the Dallas City Council in a no-win situation. Mike Davis, Finance, discussed why the Consumer Price Index may not match a family’s reality with The Dallas Morning News Aug. 4, 2008. Linda Eads, Law, talked about the merits of searching a defense attorney’s office in a Frisco, Texas murder-for-hire case with The Dallas Morning News July 27, 2008. Edward Fox, Marketing, discussed the implications of the Minyard supermarket chain’s sale of 37 Carnival stores, along with the Carnival brand itself, with The Dallas Morning News July 24, 2008. He also talked about Wal-Mart’s plans to dramatically scale down a proposed new store in Austin with The Austin American-Statesman June 24, 2008. Maria Richards, Earth Sciences, discussed geothermal energy as the “lost” component of the alternative-energy push with U.S. News & World Report July 21, 2008. Patricia Mathes, Institute for Reading Research, talked about North Texas students’ struggles with the written portion of the TAKS test with The Dallas Morning News July 20, 2008. Mark Chancey, Religious Studies, discussed a decision by the State Board of Education to allow elective Bible courses in Texas high schools with The Dallas Morning News July 11, 2008. Matt Wilson, Political Science, discussed whether Karl Rove’s criticism of Mitt Romney is aimed at helping Romney become John McCain’s running mate with Salt Lake City’s Deseret News July 16, 2008. He also talked about why both Barack Obama and John McCain need the abortion issue with Reuters May 28, 2008. Al Armendariz, Environmental and Civil Engineering, discussed the shortcomings of the new North Texas clean-air plan with the Dallas Business Journal July 11, 2008. Geoff Orsak, Engineering Dean, provided expertise for a Robert Miller column on how North Texas engineering schools are meeting the demand for engineers with state-of-the-art programs and facilities. The column appeared in The Dallas Morning News June 29, 2008. Alan Brown, Psychology, discussed his research, which may reveal the secret to winning game shows, with Psychology Today for its July/August 2008 issue. Dan Howard, Marketing, provided expertise for a story on how frugal spenders can buck an economic downturn that appeared in The Arizona Republic Aug. 8, 2008. He talked about how rising ticket prices will affect the future of the airline industry in The Dallas Morning News June 23, 2008. In addition, he discussed how General Motors’ possible discontinuation of the Hummer reflects the restructuring of the North American automotive industry with The Ottawa Citizen June 14, 2008. Jessica Dixon, Law, discussed the “puzzling” actions of Texas Child Protective Services in the case of the FDLS polygamist cult with The Dallas Morning News June 18, 2008. Frank Lloyd, Cox Executive Education, discussed the importance of capable leadership in the global petroleum industry with The Earth Times June 18, 2008. Robin Lovin, Maguire University Professor of Ethics, discussed the changing relationship between religion and politics in an essay published in Religion and Ethics Newsweekly June 12, 2008. Ron Moss, Admissions, discussed the effects of intense college admission competition among the 2008 high school graduating class with WFAA Channel 8 June 3, 2008.